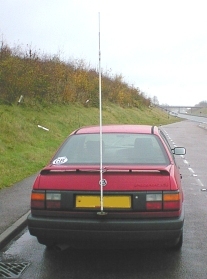 I have been operating HF mobile for over twenty years with various cars, rigs and antennas. The original setup in 1979 was a Kenwood TS120V running 10 watts to a G-WHIP. This provided contacts on 40/20/15/10 meters, but I found 10 watts was not really enough power for reliable operation and dx qsos were hard work. Although I normally enjoy QRP operation, this doesn't extend to mobile working as I found it to be rather frustrating instead of fun. In 1990, I upgraded the rig to an Icom IC725 and found that 100 watts made a big difference when operating mobile. Now I could regularly make qsos outside Europe. To give the mobile signal more "punch", I replaced the electret element in the supplied HM12 microphone with a Heil HC4. It was also necessary to modify the Icom microphone preamplifier, by increasing the value of the stage's feedback resistor to accommodate the low output of the Heil element. The IC725 is a robust reliable rig, it spent 10 years in the boot of my car with brutal temperature and humidity changes and never let me down. In June 2000, the trusty rig was pensioned off and replaced by an IC706mkIIG. I wanted to try 6 metres before Cycle 23 went into decline. It took a little time getting used to not having the IC725 as a travelling companion, but the little '706 is a truly superb rig for mobile and portable operation. When the sunspots declined in the mid-1990s, I changed from the G-WHIP to Valor Pro-Am antennas, one for 20m and one for 40m. These antennas work well and much DX has been worked on 40 metres around sunrise. It's nice to break through pileups and the Pro-Am whip seemed competitive with the many EU home stations who use low G5RV and W3DZZ dipoles on 40 metres. I would recommend these antennas to anyone, they're inexpensive, robust and reliable. The current antenna system is a Hustler with coils for all bands 40m thru' 10m. The Hustler is also robust and reliable, but not inexpensive in the UK. I bought mine in the US, where the prices were much more reasonable. This antenna is a great performer, giving good bandwidth and VSWR on all bands with a characteristic impedance around 50 ohms on all HF bands except 20 and 40 metres, where I use a toroidal matching transformer to match the lower impedance. I used to spend many hours trying to effectively resonate and match various mobile antennas using a combination of Field Strength meter, SWR bridge and GDO. Eventually, I invested in a MFJ259B Antenna Analyzer, so it now only takes a few seconds to adjust a mobile antenna for best performance. Changes to my job in 2001 meant that I spend very little time working around the UK and far more time in Europe instead. I changed my car around this time and have not re-installed my mobile gear in the new car because it's hardly worthwhile to operate HF mobile around the A406 North Circular Road.